To fulfill the final wish of her late twin sister, a girl embarks on an adventure to find buried treasure. After Sadie’s death, white teen Ruby Caine flounders. 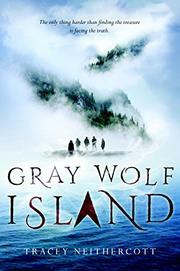 But she has one thing left: the promise she made to Sadie that she’d find the buried treasure on Gray Wolf Island. Ruby has no intention of fulfilling the request, until one day at the library she stumbles upon a poem hidden in a copy of Treasure Island—a map to the treasure that enthralled her twin. Despite her protests, a ragtag group forms to hunt the treasure. Elliot Thorne, the white nerd–turned–bad boy, Gabe Nash, the white heartthrob born (as local legend has it) from a virgin mother, Charlie Kim, the Korean boy with visions of his own death, and Anne Lansing, the Native American (nation never named) girl who hardly sleeps, make up Ruby’s merry band. But they discover that not only is Gray Wolf Island perilous, it also causes, even exacerbates mental anguish. They begin hearing whispers, urging them to speak their truths. But Ruby’s secret is too damning, and her need to conceal it may cost them more than treasure. Rich in atmosphere and characters with real depth, Ruby’s adventure sings. But an alternating perspective from an amnesiac boy whose story is connected to the origin of the treasure cuts the tension, and the reveal of the boy’s past feels far-fetched.